The Twelfth Of Never There's no denying that as a group The Osmonds captured the hearts of millions of people, yet one of them was undoubtedly the favourite both of girls ranging between 6 and 20 and their mothers. 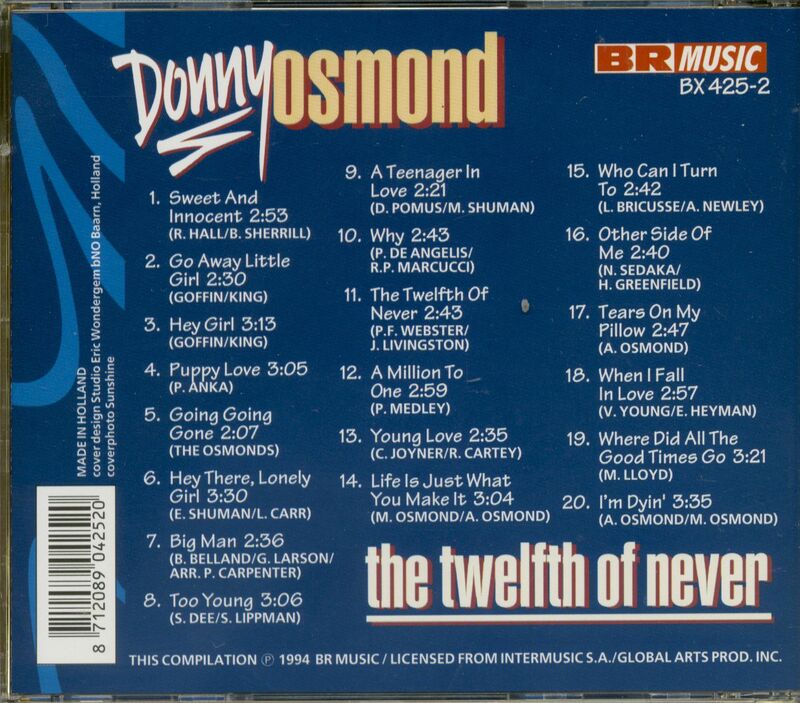 Of course we mean Donny Osmond born in Ogden, Utah, December 9, 1957, his full name being Donald Clark Osmond. When he wasp baby Sam Cooke's 'You Send Me' was a number one hit in America and in those days Donny's older brothers already sang frequently, so it's not surprising that this had an infectuous influence on Donny. At the age of 4 he asked his mother to buy him a couple of Andy Williams' gramophone records, Andy Williams being the favourite artist of the American public in the beginning of the sixties. Donny soon knew his songbook inside out and consequently joined his older brothers, The Osmonds thus becoming a quintet, which meant that their barber shop sound gave way to a more modern sound. On account of their performances in the Andy Williams television show (1962-1967) their star was quickly rising. but nevertheless it took some time before they had their first hit record with 'One Sad Apple' in 1971. That same year Donny topped the charts of the American Hot 100 with 'Go Away Little Girl', the funny thing being that this was the first song in the history of rock 'n' roll to become a number one hit in two different versions. In 1963 the song was number one in the hit parade thanks to the vocal qualities of Steve Lawrence, while Donny recorded the same song in 1971 and again scored a hit. The reason for this release was the fact that Carole King due to her album 'Tapestry' had become the 'hottest artist of the year' so as a result many singers recorded songs that had been written by her. Rick Hall, Donny's producer also considered her `Go Away Little Girl' suitable for his repertoire and he made the right choice. After his solo debut with 'Sweet And Innocent' . Donny showed the world his real vocal qualities in 'Go Away Little Girl'. Donny would make a string of covers performed by great artists from the past. The r1 follow-up of 'Little Girl' was another track from the Goffin/King songbook, 'Hey Girl' a hit for Freddie Scott back in 1963. Donny also recorded covers of Paul Anka's `Puppy Love', Nat 'King' Cole's 'Too Young', Frankie Avalon's 'Why' and Johnny Mathis'The Twelfth Of Never', and all of them became top hits. 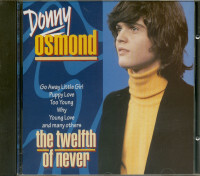 He also recorded with his sister Marie, songs like 'I'm Leaving it (All) Up To You' and the evergreen 'Deep Purple' which are both featuring on the CD 'The Osmonds - Greatest Hits' (cat. no. 9X424-2). Says Donny Osmond 'our cooperation was so successful that we had our own television show with ADC, starting in 1976 and ending in 1979. Despite all the hustle and bustle of our television series I found time to get married during that hectic period. People who remember me from the time I appeared in the Andy Williams show find it hard to believe that I now have two kids of my own. So time flies'. 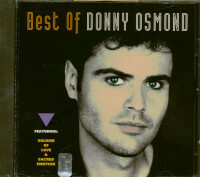 According to Donny Osmond his years with The Osmonds and his solo performances have left an ineffaceable memory behind.' People used to ask me if my brothers were jealous of my solo career but I can assure you that we were always and have remained the best of friends. My brothers have always looked favourably upon both my solo career and my duets with Marie and the same goes for our little brother Jimmy. When he suddenly scored a hit with `Long Haired Lover From Liverpool' we all it. In all honesty I can say that there was no jealousy within our family which is perhaps due to our religious faith '. When their best years as a group were over Donny continued singing occasionally and he was lucky in that show business has remained faithful to him. He participated for instance in a revival of the musical 'Little Johnny Jones' and he has his own production unit nowadays called Night Star and has produced a programme for Grover Washington Jr. among other things. Says Donny 'show business is always on the move and people always have to cope with challenges. If you have made up your mind to work in showbiz you commit yourself and have to make the best of it no matter what it takes. At the moment I'm involved in satellite television and I'm absolutely fascinated by it. gut let's face it I'll never forget those years as one of The Osmonds, they shaped me and I learned a lot'. Kundenbewertungen für "The Twelfth Of Never (CD)"